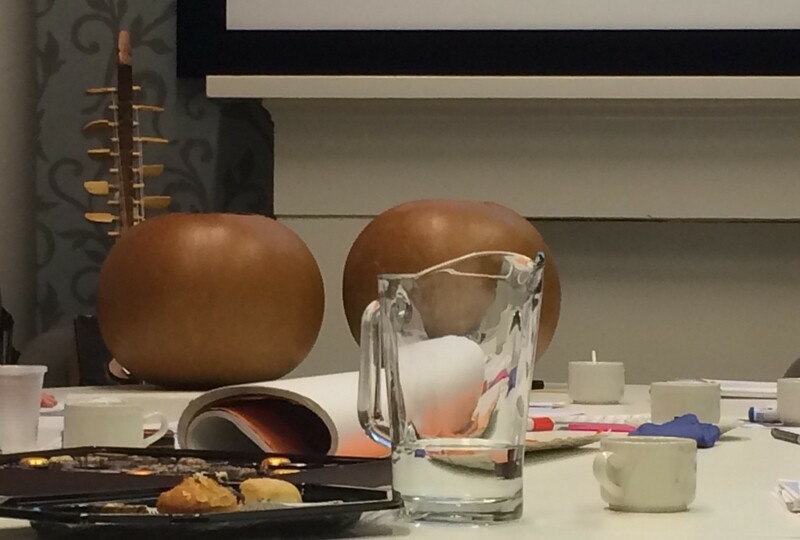 Colleagues from the creative arts hub of the RM project collaborated with colleagues from Case Study 2 (project title: Translating Vulnerability and Silence into the Legal Process) and from the researching multilingually hub on a one day internal project symposium (Friday 2nd December 2016, University of Glasgow) to explore diverse perspectives on themes emerging from research in legal contexts. The day had a retrospective aspect (discussing responses to a shared experience of an Arizona court room in March 2016), a reporting back aspect (colleagues researching in legal contexts in Scotland and England shared emerging insights from ethnographic observation work), an experiential aspect (a performed role play, an individual experience of silence and a symbolic posting of messages to fill a ‘jar of silence’) and a discursive aspect across disciplinary, professional and practice boundaries (including virtual involvement of colleagues from Arizona and London). In the sections below we provide some insights into the way in which we engaged together on issues of the law as practiced in relation to immigration cases in particular contexts, individuals’ experiences of hearing and being heard (or not), and diverse uses of languages and silences. A discussion of “Operation Streamline” took place from our multiple perspectives – as creative artists, applied linguists, intercultural communication experts, anthropologsts, education specialists, literature specialists as well as legal academics. The discussion was informed by first-hand experience of attending a court hearing in Tucson, Arizona in March 2016 for some participants and for others by a reading of Doug Keller’s article “Re-thinking Illegal Entry and Re-entry” (2012) Loyola University Chicago Law Journal Vol 44, 65-138. The article explains the “criminalisation” of immigration control procedures in the USA, culminating in “Operation Streamline” and provides a valuable chronology of the time leading up to the implementation of OS. This video also fed into our developing understanding of how activists are challenging OS. Sarah Craig, Anna Beesley and Susannah Paul have been involved in the Bail Observation Project. They reported and reflected on their IBOPS findings. Taking into account the distinctiveness of the physical and communicative context in which bail hearings take place and the high stakes nature of the experience for people in immigration detention, the researchers chose to collaborate with project creative artists to develop a fictionalised role play to be performed to colleagues to convey the communicative challenges inherent in this context. The audience witnessed communication and miscommunication taking place via a laptop, partial translations and interpretations, and the general display of powerfulness and powerlessness within this complex scenario. If silence could be heard, what would it sound like? What needs to be silenced for you to be heard? Who needs to speak for you to be heard? (2) listening to what “silence” sounds like in the calabash and other instruments, and reflecting on the questions that way. Judith Reynolds’ doctoral research provides in depth insights into the nature of communication between asylum applicants and refugees and the lawyers who advise them. Judith’s research is attentive to how trust is constructed between those interacting together and their uses of language to build bridges as well as negotiate the complexities of the legal context. Judith’s methodology is driven by linguistic ethnography which allows her to explore translanguaging in interactions and uses of tools such as smart phones to access information and translation tools. The role of the Researching Multilingually hub within the large project is to look across the case studies and the work of the creative arts hub seeking to understand ways in which language is used to support or hinder communication and understanding in complex contexts of pain and pressure at border sites. As such the final part of the day involved a brief update on recent work that the hub had been developing in terms of learning from diverse disciplines and theoretical work to shed light on the project’s work. Particular attention was given to the work of Linda Tuhiwai Smith (1999/2012) “Decolonising methodologies – Research and indigenous peoples” on how research needs to be reconceptualised as an act of “radical compassion” which serves the function of “getting the story right, telling the story well”. After a day of developing our understandings of how stories are told in high stakes legal contexts, this message was particularly powerful. This entry was posted in Case Study 2, Events and tagged Case study 2, Law. Bookmark the permalink.